Each week, as our regular readers know, we pose a series of questions to a winemaker. This week, we are featuring Andrea Franchetti of Tenuta di Trinoro and Passopisciaro. Andrea is, well, a lot. 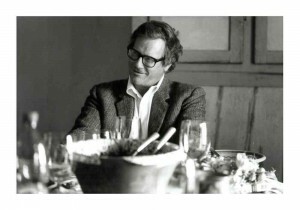 Perhaps Jancis Robinson described him best in 2002: “Andrea Franchetti looks like a youthful Yves Saint Laurent, complete with impressive height, heavy specs, mop of tow hair and out-of-focus look. His speech is a cross between a mumble and a Washington state growl through the teeth. He would make a pretty good film star but at the moment is utterly focused on his idiosyncratic wine estate Tenuta di Trinoro which has achieved quite remarkable renown considering it was first planted in 1992.” And with that description, I’ll let Andrea do the talking. As you’ll read below, he is intellectual, artistic, and deeply insightful about the craft of winemaking. Enormous thanks to VinConnect — the U.S. company that enables U.S. consumers to order Andrea’s wine directly — for facilitating this interview. Check it out below the fold! I was born in New York City and raised in Rome, Italy. I left New York right after I was born, but then I returned there multiple times. It was the most difficult part of my growing up, as I stayed there extensively, as a boy, then a youngster, then older. I didn’t like the latter two periods of my stay in New York, but the first period was important. It was then a magically silent city with an alarming, dangerous energy: it was winning the Cold War simply with its urban style, its coolness, the new art being made there. My Italian uncle took me around with the new painters of the time, Rothko, Rauschenberg, while my American uncle took me through the new, optimistic, air-conditioned business offices. Rome was poor, but then started becoming so fascinating because of the breeze of the sixties that I dropped out of school to breathe it properly. My uncle had opened a gallery there where the artists of that generation were all showing their paintings. This went on right through the seventies, after which I got tired of the city, sold one of those paintings, one by Cy Twombly, another uncle, then bought the land that afterwards became Trinoro. It was because of a small farmhouse on the land I had bought, lost in a valley somewhere between Lazio and Tuscany in the 80s. A decade later, I returned to restore it, and after the first night when I slept under the new roof, I decided to stay. Growing grapes appeared to maybe be the best way to fill the time in that scenery. I also thought that I would one day be able to express the scenery through the wine. I spent most of the next two years in Bordeaux, being introduced to winemakers, living a bit in their chateaux, helping, learning, researching. It was the early nineties, a time of a big wave of rethinking about wine there, discovering more about yeasts and their influences on the taste of wine; lowering production in the vineyards; and looking at the taste of certain new wood in the cellars. There was an anti-establishment, anti-big-chateaux movement happening, where smaller amounts of wine could be made better, more carefully at every stage, continuously compared to the classic producers, all while dot-com money was coming in and the wine towns were filled with eager visitors. Back in the valley, I planted where the light caught on the ground, especially along the mountain’s side facing southwest at an altitude of about 600 meters; the place was incredibly wild and abandoned, yet it had soil that reminded me of the Graves and Saint Emilion. I bought a tractor and started planting where the soil was loosest and with the thickest order possible on a steep exposure, one meter by one meter. The work was carried out by a swearing French team accustomed to the light soils of the Medoc, but then they came back, year after year, planting some three hectares at a time from 1992 to 1999. I had chosen the Bordeaux varieties: Cabernet Franc, Cabernet Sauvignon, Merlot, Petit Verdot, with a strong preponderance of Cabernet Franc. This material came from clonal selections developed by the Blancfort Institute (the ones with the smallest grapes), as well as from field selections I had cut from some old parcels that traditionally had produced the best wines in certain chateaux in Bordeaux. I have made wine for 25 years at this place Trinoro, making the wine I called Tenuta di Trinoro, a Bordeaux blend. I went to Paliano and Piglio near Frosinone, in the province of Lazio south of Rome, because everyone was suggesting I make wine with an Italian varietal. There, they have a tasteless old Roman big red berry called Cesanese, which is the name used for all reds of the region; but lost in the rows, I found a small-berried, exotic-looking plant that produced an aromatic, exotic liquid. It’s a grape brought there from Sicily in the 1700s called Uva Turca, then Cesanese d’Affile (Cesanese specifically from Affile). I gathered all the cuttings I could find and grafted them, planting them at Trinoro. They later disappeared where I had discovered them, but there was this planting of mine that acted as a nursery. The wine I made with this Cesanese d’Affile, called Cincinnato, made a splash; others then could serve themselves here and plant the extinct vine in Paliano, Piglio, Anagni, near Frosinone. It’s now the mainstay of those appellations. I started making wine on Mount Etna in Sicily in 2000: It really started when I found a little piece of land, which I called Passopisciaro. It’s quite high there, almost at 1,000 meters. I went on vacation in Siracusa and thought, Sicily is so hot, you could never make a good wine here. Then one day I went up Etna, and as soon as the sea disappeared behind me, it was something completely different. When I was purchasing the property of “La Guardiola” on Mount Etna, the job was to clear the hundred and thirty terraces that lay buried under the steep, flowering overgrowth on that part of the volcano. I found old plantings of Nerello Mascalese, the local grape, across the mountain and bought up land. Then, being there for awhile, observing, studying, digging around, I understood that every type of lava that flows from the mountain produces different flavors of wine; I decided to make single lava-spill renderings of Nerello every year starting in 2008. That year, I started gathering all the producers at my winery Passopisciaro, and we did a sort of primeur, pouring wine from the most recent vintage straight from the barrel, at the event I started that is known as Le Contrade dell’Etna. Some of the most important journalists began to come and taste through the wines, with everyone there, one next to the other. They published their notes in some of the major newspapers and magazines throughout the world. It’s that which really created, launched Etna. It also worked as a sort of glue in the community because everyone who was there together in the beginning is still friends. I had also decided to plant something other than the ever-present Nerello Mascalese, that could express what an Aetnean wine is like in my image of it. I chose Petit Verdot and Cesanese d’Affile, bringing that grape back to Sicily, to make a completely different kind of wine: rich and inky, but bright. I planted those vines densely at La Guardiola, 12,000 plants per hectare. I also planted a few hectares of Chardonnay on steeps terraces up to 1,000 meters, in very loose, deep, powder-like lava that is high in minerals, in order to make a great, long-lived white on the volcano. The harvest of the white grapes is quite fussy, where we pick little portions of the vineyard every day, tasting the berries trailing along the terraces day after day, picking only when each individual cluster is ripe. I’ve done other things, like make wine in Bordeaux as part of The Winemakers’ Collection at Chateau d’Arsac in the Medoc. I started several properties in Tuscany. But I am mainly at Trinoro. The Val d’Orcia hangs high between two mountains like a bowl of blue clay. On the other side of the mountains, the lands fall down to the sea or to deep valleys in the interior. Air in the valley whirls with harder temperatures than those in any part of Central Italy, changing the behavior of the vines and distinguishing them from all other central Italian vines. Rains fall outside the rim of the bowl, and bad weather circles around it. Placed under a mountain, Tenuta di Trinoro has a mosaic of soils. The vines, densely planted, are more than twenty years old and, with their extended root system, they have become able to render a distinct taste from every terrain of the estate. Every year at harvest when grapes come in the winery, they immediately are a little more distinct in their flavors that emanate even from the cases they are carried in. Thicker, longer roots mean that the plants have increased their exposure to soil, and the flavors of the berries are ever more influenced by it. Mount Etna rises through layers of increasingly cold air, higher than the Dolomites. The hued cellars laying collapsed on the blank slope, thousands of stone-walled terraces disappearing up to the mountain. When I started Passopisciaro, it seemed crazy to restore vineyards up at 1,000 meters on the northern side of Etna, where vines have always been planted. Thousands of mouths across a fifty-kilometer diameter have spit lava from every different depth under the earth, covering the surface of Etna where vines take root. Flowing lava — descending sometimes dense and slow, at times fast as water — eventually stops, spreading and hardening at various altitudes. After cooling for many years, these flatter areas over the centuries became established properties, each one producing a different taste of wine because of the different mineral origin of their soils and, more importantly, because of the grain that the lava had broken into during its cooling process: sand, gravel, powder, or rock. Under their same old names the properties became territorial subdivisions called Contradas, and, with regards to the wine, they represent Etna’s own version of a cru. Cru, a word that suggests areas that bring a typical, recognizable flavor to its produce, finds an almost exaggerated example in Etna’s Contradas. The arrival of new producers on Etna started with my own in 2000, and everyone’s winemaking since then has been showing the superiority of taste of the same handful of Contradas that were considered the best before World War II, when winemaking was very active. The names appear increasingly on the labels in this Renaissance of Etna wine. That the wines are irresistable at first, then communicate a vision. Making wine is a work of art that changes with every year. A person is influenced during that year by the landscape of the place where he makes it. He is impressed by the natural scenery of the every day, through the changing seasons, and transfers this impression to the wine he makes. So, first: every year the wine is different. Second: as I change, my winemaking changes. Wines carry the signature of who makes them. Wines are very much like the winemakers who made them. To get over each harvest. I must make the wine, decide when to pick each small part, because harvest timing has more effect on the style of the wine than any other act of winemaking. Picking is the most difficult thing: to decide when to do it, and you need a lot of experience to pick at the right ripeness, not under ripe nor overripe, closely following the moon’s furious ripening tide. One day of difference changes the wine completely. Then you have to manage the fermentation, and all the hundreds of stages of winemaking after that, each one of which calls for a decision, and they all accumulate, giving a particular style to the wine. It is too complicated to describe them, but it continues until you bottle, some twenty months later. I then have to choose how best to assemble the wines that have then emerged from the numerous fermentations. Slowly a style will form during the discarding and choosing and mixing. Emile Peynaud, Alan Vauthier, Bernd Philippi, Roberto Voerzio, Francois Thienpont. These are three generations of winemakers who have impacted me. Peynaud who in sixty years at Bordeaux, consulting and chairing the Bordeaux oenologic faculty at the university there, shaped modern winemaking. Then Alan Vauthier at Chateau Ausone, the herald of new scientific breakthroughs in the 90s and of less acidic, ready to drink, opulent wines in Bordeaux. Bernd Philippi, Pfalz’s Rhine Riesling owner, expert on crus and clones, but also the propagator of grape varieties in Canada, USA, Germany, now Portugal — a true master. Roberto because he liberated Barolo from the old school of masochistic Piedmont suffer-while-you-drink and made flowerful, black, fruit laden Barolos; I first imported his wines to New York in 1982! There are some I admire professionally, like Peter Sisseck. A few good ones who continue their terroir practice in their own region of birth. There would be Eben Sadie, but he has disappeared. There are none though, recently, who have invented something new, something that didn’t exist before. I would define a new wine by the following: (1) made with a new style of winemaking; (2) using a grape that has never been used by itself before, and was as good as unknown, but that one could foresee it being able to make a seriously great wine that can also age and get better; and (3) choosing an entirely new place where wine didn’t happen before, or at least where great wine didn’t happen. It is also true that at a certain point, too many “new” wines were being invented and became a confusion and a problem for those who had to drink them. Bordeaux. After all, my wine education took place there, in a magic and innovative period for French viticulture. Old wine: Lafite ’55. New wine, I think a Chenin Blanc from Loire, can’t remember whose. I am sorry but I don’t have a cellar anymore except for my own winery’s archives. Right now, there are samples of merlot pickings that fermenting now here at Trinoro. At Trinoro, practically everything is grown or raised on the estate, dishes changing with the seasons, meats like guinea fowl and young lamb coming to the table as they are ready. A 15-year-old Kunstler Riesling and the 1990 Petit Cheval, a wine I found so beautiful that I fell for Cabernet Franc, would go wonderfully with any of the meals this fall. I like to drive around, looking at places in Italy. I love Le Marche, with its fresh, cultivated hillsides, packed with antique villages, steep fields flung high, hedges and white streets climbing toward the light; Naples, the city of the heart, with its infinite good weather and the bay you can walk eternally; Sicily, with its warm villages and shy lights. I look at the old cities, the stone pavements, the ancient arches and staircases, details that make me mad for Italy. I have begun making wine with varieties in Southern Russia, in a grand, unbothered, soulful piece of that vast country. After finding the right parcel of land, I started to look at choices of varietals for that place. I’ve learned of the three categories of Russian grapevines — those from Crimea, from Krashnodar (the Black Sea), and from Georgia — and it is the first that has the most promise, especially to make great white wines. I like architecture; I love finding antiques, restoring structures. I am learning to build something from scratch for the first time on a new property in Sicily. But I can’t think of not making wine: I don’t know why I make wine, it’s just something I have to do. A person’s instinctive, intimate thought is unique, awkward. We don’t see it often acted upon, but in the cases when it is brought to life, people stop and are attracted to it — they don’t just find it interesting, they find it poetic. It’s something that we need. So I find that success is the moment when people, looking all the time for something that rings true, see and love that you are following your own thought in what you do. Recognition follows quickly, especially with the media always reporting and supplying tons of information about what goes on, in every field.